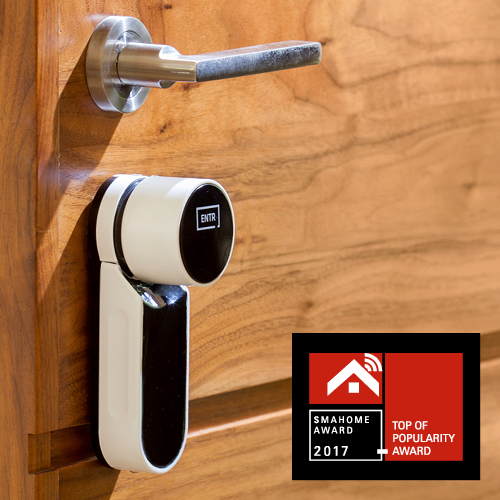 MAY 2017 – Mul-T-Lock’s ENTR® Smart Door Lock has won a premier product innovation award from global connected home publication, SMAhome. 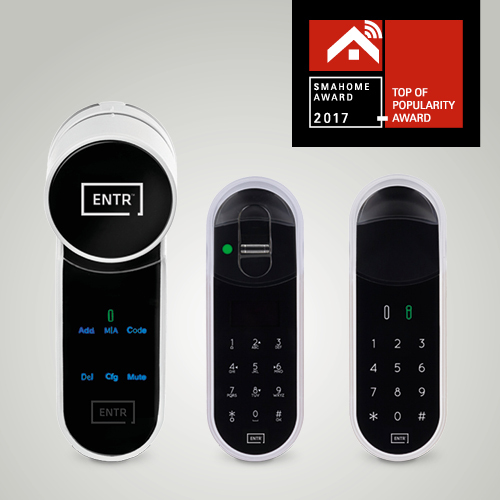 The ENTR® lock was selected from among 28 smart home product finalists to receive the overall Popularity Award for 2017. SMAhome awards are judged anonymously by a jury of industry insiders, including system integrators and service providers with an established track record in this market. ENTR®’s affordability, convenience, sustainability and easy integration with leading smart home ecosystems were cited in the SMAhome award announcement. Award winners were announced in a ceremony at the Taipei Nangang Exhibition Center in Taiwan. It takes just one screw to fit an ENTR® lock and transform a front door into a smart front door. With ENTR®, homeowners can open their door via app, PIN code, remote control or fingerprint reader. ENTR® makes domestic key troubles a thing of the past: there’s no longer any need to get a spare set cut for kids, cleaners, carers or temporary workers. A couple of swipes on a smartphone screen is all it takes to share an ENTR® digital key with family or anyone who needs access — and to revoke the key instantly when required. The Mul-T-Lock ENTR® Smart Lock works equally well as a stand-alone solution or connected to a smart home system.